Bestselling historian Keith Lowe's The Fear and the Freedom looks at the astonishing innovations that sprang from World War II and how they changed the world. The Fear and the Freedom is Keith Lowe’s follow-up to Savage Continent. While that book painted a picture of Europe in all its horror as World War II was ending, The Fear and the Freedom looks at all that has happened since, focusing on the changes that were brought about because of World War II—simultaneously one of the most catastrophic and most innovative events in history. It killed millions and eradicated empires, creating the idea of human rights, and giving birth to the UN. It was because of the war that penicillin was first mass-produced, computers were developed, and rockets first sent to the edge of space. The war created new philosophies, new ways of living, new architecture: this was the era of Le Corbusier, Simone de Beauvoir and Chairman Mao. But amidst the waves of revolution and idealism there were also fears of globalization, a dread of the atom bomb, and an unexpressed longing for a past forever gone. All of these things and more came about as direct consequences of the war and continue to affect the world that we live in today. 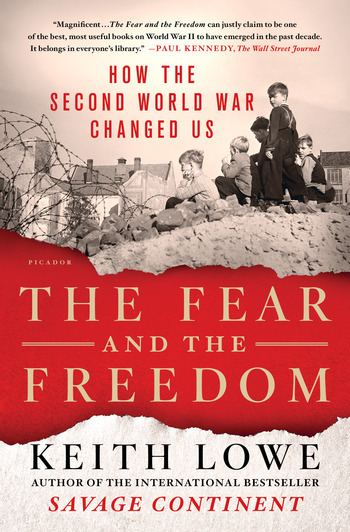 The Fear and the Freedom is the first book to look at all of the changes brought about because of World War II. Based on research from five continents, Keith Lowe’s The Fear and the Freedom tells the very human story of how the war not only transformed our world but also changed the very way we think about ourselves. KEITH LOWE is the author of the critically-acclaimed Inferno: The Devastation of Hamburg 1943, and Savage Continent, an international bestseller and the winner of both the Hessell-Tiltman Prize for History (2013), and Italy’s prestigious Cherasco History Prize (2015). He lectures on both sides of the Atlantic, appears on TV and radio in Europe and the US, and writes for a variety of magazines and newspapers around the world. He lives in north London with his wife and children.